When I first started work on The Dark Brotherhood Resurrection: Part 1, I tried from the very beginning to keep my expectations in check, and my scope narrow. My primary goal was to design a mod for Skyrim that I could complete in three months. I decided I would only be adding two new characters to the Dawnstar Sanctuary. I was going to let these characters have back-stories with relevant quests, but I wasn't going to let myself do more than 4 quests each. I ended up adding several characters to the story (though only Stabby and Averna would be followers) By the end of the project, Stabby had 11 quests, and Averna had 8. It took me half a year to finish TDB Resurrection: Part1. Originally stabby was just going to give you 4 random guys to kill in interesting ways, but then I got the bright idea to tie these murders together in a larger arch. This ended up taking the mod in a whole new direction about two months in. Honestly, what I am most proud of is the quests that I cut. About once a month I would evaluate my progress, where the mod was going, and what I was realistically going to be able to finish. 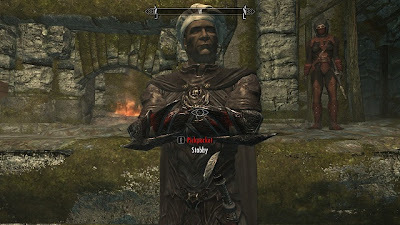 A whole questline involving Stabby's search for a daedric weapon, and learning of his true parentage, was cut. At one point after killing a wealthy victim and selling his things, stabby was going to invite you to drink at the bar, pick up some chicks, and bring them back to the sanctuary. I thought it would be interesting to script random conversations between the Dark Brotherhood 'groupies' and the actual members, but obviously the complexity and sheer number of interactions that would inevitably result was too much for me to finish in a few months. Still, I am proud of sticking to my main objective: to produce a quality mod for Skyrim in less than a years time.